Three more people have been arrested by police investigating the murder of a 26-year-old man whose decapitated body was found in a Bedfordshire lake. The body of Michael Gilbert was found at the Blue Lagoon in Arlesey on Sunday, wrapped in layers of packaging. Two women and a man were arrested on Thursday, following the earlier arrests of two men, aged 22 and 24. Hertfordshire's mobile police station is at the Blue Lagoon as officers appeal for information. Posters appealing for anyone with information to come forward have been displayed around Arlesey. 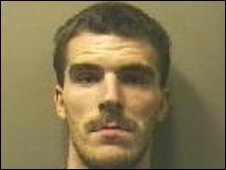 Officers said Mr Gilbert, who had been living in Blackburn, Lancashire, also had links to Cambridge and King's Lynn in Norfolk. A wheelbarrow found close to where his body was found is being forensically examined. 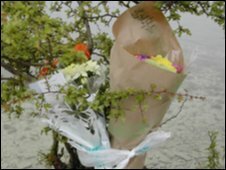 Det Ch Insp Jon Humphries said: "While we have made five arrests, this is still a very active inquiry and we still need people to help us establish how and when Michael's body was taken to the Blue Lagoon. "We hope the posters will prompt people to think about where they were and what they saw over the two weeks or so prior to this grim discovery. "We know the body had been in the water for several days and are very keen to speak to people who regularly go to the Blue Lagoon and would remember seeing the wheelbarrow suddenly appearing."